E Fun has announced a new tablet that is available at Walmart just in time to give someone on your Valentine’s list. 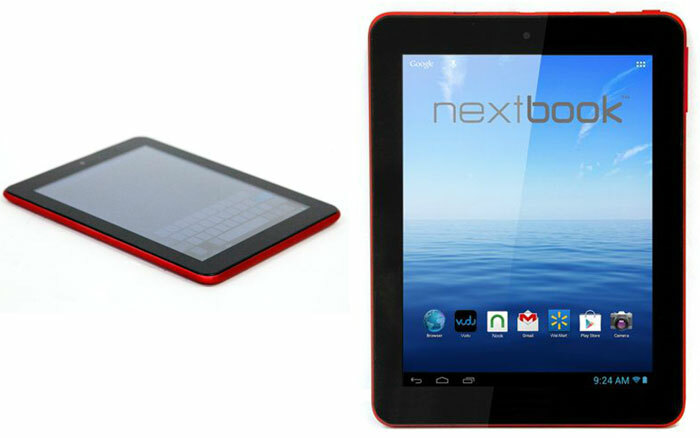 The tablet is a new red version of the Nextbook Premium 8HD. The tablet has a red back plate and is available in stores only for $99. That $99 price tag makes this one of the cheapest 8-inch Android tablets out there. The tablet runs Android 4.1 for the operating system. Internal storage is 8GB and the tablet has a dual core processor. The processor operates at 1.5GHz and is an ARM Cortex A9. The processor is paired with 1GB of RAM. E Fun also equips the budget tablet with WiFi and a microSD card slot. That memory card slot means the storage is upgradable. The rear camera is a 2MP unit with a 0.3MP front camera for video conferencing. The cameras also have autofocus and digital zoom. Other hardware features include a mini HDMI port and a G-sensor. Power comes from a rechargeable battery. The tablet can access Google Play for movies, games, and music. E Fun teamed with Vudu on the tablet and it includes five free digital movies and a $5 coupon for another movie.